In what must surely rank as the most overdue blog post of all time, I’m finally getting around to writing about a last year’s Monteraponi wine dinner in Il Vicoletto, Temple Bar, Dublin. The delay certainly can’t be attributed to any hint of indifference towards the wines (or the food for that matter! ), for it’s now a running joke between Monteraponi’s importer in Ireland, Enrico Fantasia of Grapecircus, and I, that all I seem to drink lately is Monteraponi Chianti Classico. Kerin O’Keefe and Eric Asimov are fans too, as is fellow blogger Joanie Karapetian of Italian Wine Geek who described Monteraponi as ‘the bottle of Sangiovese that changed her life‘. Monteraponi is an ancient borgo high in the hills near Radda in Chianti. Michele Braganti, whose family bought the property in the 1970’s, produces an artisan Chianti Classico with minimal intervention exercised in the limestone rich vineyards and the cellar. On this winter’s evening in Dublin, we had the opportunity to taste through almost all of Monteraponi’s wines with importer Enrico on hand to introduce them. The evening kicked off with the Trebbiano 2012 which was served with seared king scallop, Hick’s black pudding, caramelised onion and goatsbridge caviar. I’d been keen to try Monteraponi’s Trebbiano for some time – aged in used barriques, it had a slightly honeyed character. Mineral with good persistence. We swiftly moved onto the reds, opening with the Chianti Classico 2012 alongside wild boar ravioli. I love Monteraponi’s expression of Chianti Classico and have been drinking my way through my remaining bottles of 2010 of late. In my experience, the hallmark of Monteraponi’s Chianti Classico is impeccable balance – heady Radda perfumes, freshness, lively acidity, classic Sangiovese fruit with a savoury edge. And it was the acidity which really carried the day in the 2012 – mouthwatering. Undoubtedly the best 2012 Chianti Classico I’ve tasted to date. 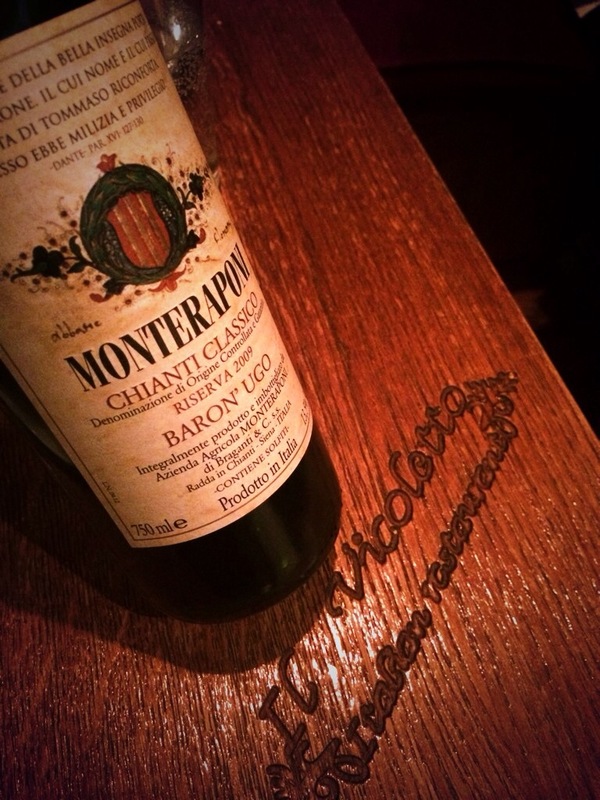 Next we approached the two single vineyard Monteraponi Chianti Classico Riservas – Il Campitello and Baron’ Ugo. Both were from 2009 – a vintage that I’ve found it difficult to get a proper ‘read on’. Some areas seem to have suffered badly from the scorching heat of the summer whereas others were reportedly saved by cool nights and a September cool-down prior to harvest (see this 2009 vintage report from Michael Schmelzer of Monte Bernardi in Panzano). It’s been a mixed bag of those I’ve tasted to be honest – some overly ripe, others well balanced. Thankfully both of Monteraponi’s efforts were firmly entrenched in the latter camp. Monteraponi’s base riserva blends are 90% Sangiovese, 7% Canaiolo and 3% Colorino aged in a mixture of french and Slavonian oak with the final period before bottling spent in concrete. First up was the Il Campitello – a vineyard 420m above sea level. It was poured alongside my favourite dish of the evening – panfried Hick’s pork fillet in marsala sauce. Noticeably fuller than the Chianti Classico annata, the Il Campitello was dark and spicy with slightly dusty, even chalky tannin. Ripe and dense with a mineral backbone – blackberry, spice and liquorice flavours emerged. Lots of interest here. The Baron’ Ugo 2009 followed and was paired with Wicklow lamb cutlet. At 570m above sea level, the Baron’ Ugo vineyard probably ranks amongst the higher vineyard sites in the Chianti Classico region. Initially slightly reserved, it eventually revealed lots of lift and freshness despite a slight shift toward drier, bitter cherry fruit. A powerful (only 13.5% alc. though) and structured wine but with an underlying tension and purity. A wine of unmistakeable pedigree. Enjoyable now, but I won’t be touching my remaining bottles for a long time. The dinner finished with a glass of Monteraponi’s fantastic vin santo and a resolution that my attempts to make up for lost time with Monteraponi needed to be matched by more frequent visits to Il Vicoletto, a restaurant which showcases authentic Italian dishes alongside a wine list packed full of classics. Monteraponi’s wines can be bought in Ireland from Grapecircus, Sheridan’s Cheesemongers, The Wine Workshop and Mitchell & Son. 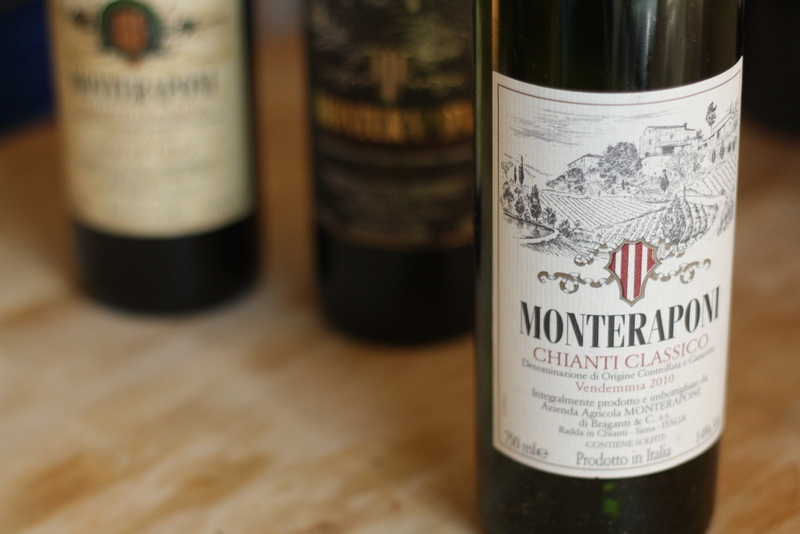 Monteraponi makes some excellent Chianti Classico and the story behind the winery is so interesting, too. Love their wines but never tried the Vin Santo. Great post! Cheers! Excellent write-up! I am long over due to explore my mother’s family’s Irish roots… nice to know when I am able to make the trip I can enjoy some Italian wine along the way! Cheers! Absolutely! Lots of great places to have a glass of Italian wine here.